Your gallbladder works together with your pancreas and other organs that aid in the digestion process. Certain types of foods can cause your gallbladder to become inflamed and irritated and cause gallstones to form. Gallbladder inflammation can cause intense pain. If you begin to experience symptoms of gallbladder inflammation, voice your concerns to your health care provider. Your gallbladder can become inflamed when bile from your liver becomes so concentrated that it forms a gallstone. Depending upon the size of the gallstone, it can partially or completely block the duct that leads from the gallbladder. You can also develop several gallstones at once that act together to cause blockage. The type of food you eat greatly influences how much bile your liver produces and gets stored into your gallbladder. Fatty foods such as deep-fried foods, foods high in cholesterol and spicy foods can all trigger a gallbladder attack and cause inflammation. 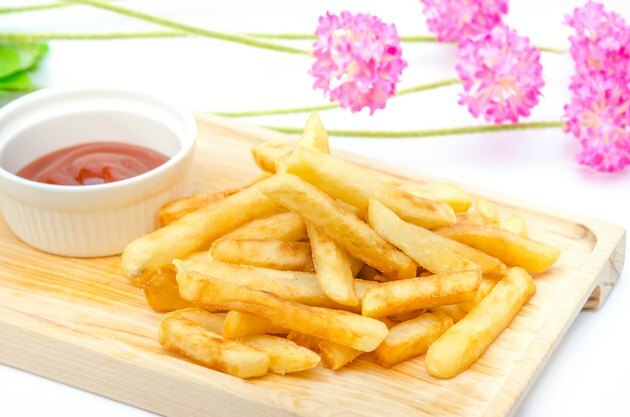 Deep-fried foods include fried chicken, French fries that are fried instead of baked, fried onion rings and fried snacks such as breaded mozzarella cheese or egg rolls. Foods high in cholesterol include eggs, particularly the yolks, organ meats and pastries. Spicy foods that can trigger a gallbladder attack include jalapeños, foods coated with buffalo sauce or foods cooked with cayenne pepper. When your gallbladder becomes inflamed, you can experience pain ranging from a dull aching cramp to a sharp stabbing pain. The pain may start or become more severe after you eat, especially if the meal was fatty or high in cholesterol, as your gallbladder is forced to try to process foods that you eat. You may also run a fever and have chills. You can also experience diarrhea, nausea and vomiting. You may suffer from what seems like acid reflux and heart burn, especially after consuming a meal. Gallbladder inflammation may also suppress your appetite. Obesity can cause chronic gallbladder inflammation. Losing a safe amount of weight, about a half of a pound to two pounds per week, until you are no longer obese may decrease gallbladder inflammation and the symptoms associated with it. If the pain becomes persistent and severe, see your doctor right away. You may need surgery to correct the problem, as gallbladder disease can be life-threatening. Avoid eating fatty foods and foods high in cholesterol. How Quickly Does Cholesterol or Triglycerides Rise After a Fatty Meal? What Fruits or Vegetables Are Good for the Gall Bladder?